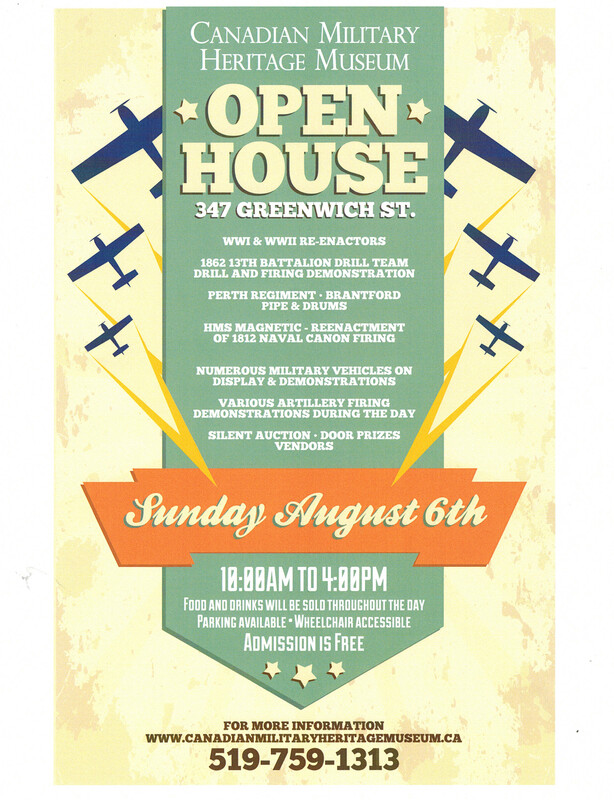 The Canadian Military Heritage Museum will be hosting its Annual Open House on Sunday, August 6th, 2017 from 10 AM to 4 PM. It’s a great community event with FREE ADMISSION. Tour the museum, witness artillery firing demonstrations and the 1862 13th Battalion Drill Team, enjoy a pipe and drum band, re-enactors in full WWI and WWII military dress as well as a chance to win one of many door prizes. A silent auction will be held with great items to bid on. Check out the used book sale table where you can purchase at a very low price numerous military books. Food will be available and there is ample parking. The museum is also fully accessible. REMEMBER SUNDAY, AUGUST 6th from 10 AM to 4 PM for a great experience at the museum. 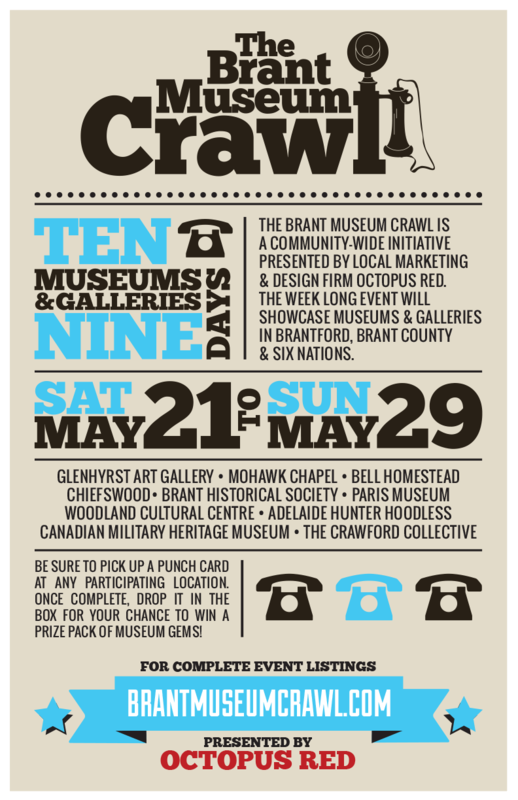 The CMHM will once again be participating in the an nual Brant Museum Crawl week being held from Thursday, May 18th to Sunday, May 28th. The museum will be hosting an OPEN HOUSE on FRIDAY, MAY 19th from 10 AM to 4 PM with FREE ADMISSION and FREE POP and HOT DOG for every visitor. Come and discover the many stories of those that have served so valiantly and be touched by the sacrifices made by those that fought at Vimy Ridge. There is so much to see and learn at the museum. Take the opportunity to enjoy the Brant Museum Crawl Week as you explore the many museums and galleries that are a vibrant part of Brantford and Brant County. After many volunteer hours during the winter months, the museum is pleased to present new and exciting exhibits for the 2017 season. This is an important year with the recognition of the great battle at Vimy Ridge in 1917. Displays have been updated to acknowledge this significant time in our military history to honour those that fought and gave so much during WWI. As a new feature, a hologram exhibit has been created by Rainey Media that presents a human and emotional side of life in a WWI trench…you definitely want to see this. The museum is open and awaits your visit. Please check days and time for our operating hours. Things are busy at the museum as we prepare for the upcoming season. Display cases are being updated and a new exhibit featuring Vimy will be presented. We are excited to bring to our visitors a new hologram exhibit in our WWI trench area that will bring to life the experience of one soldier. Our major renovations that were to be completed in time for this season had to be postponed but will be proceeding later this year to be ready for 2018. Take a look at our Facebook Page and follow our progress as we strive to work hard to bring new experiences to our many visitors. The museum is now closed for the 2016 season but behind the closed doors exciting things are happening. During the winter months renovations will be undertaken to bring a new look to the museum in its exhibits and displays and a new main entrance and façade will be constructed. Follow the progress of these exciting projects on our Facebook page by clicking on the icon at the top. The museum will reopen in the spring of 2017 updated and refreshed both inside and out. 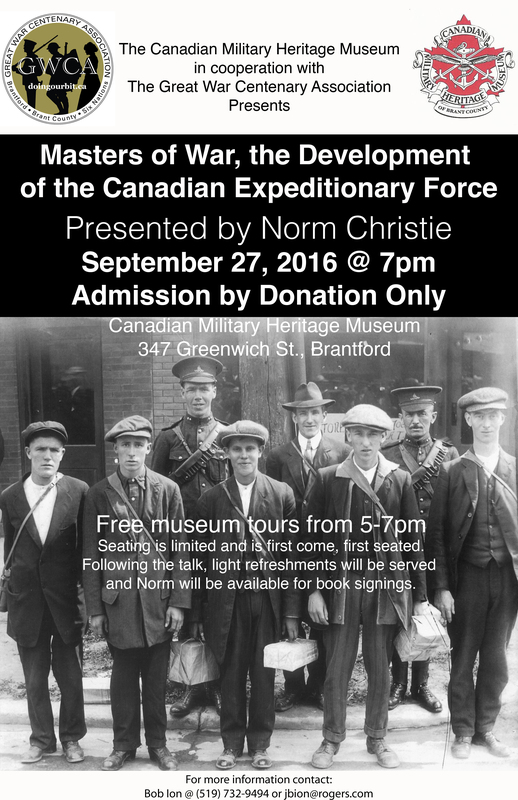 The CMHM in partnership with the Great War Centenary Association is pleased to announce that Norm Christie, acclaimed television History Channel documentary host and author, will be speaking at the military museum on Tuesday, September 27, 2016. 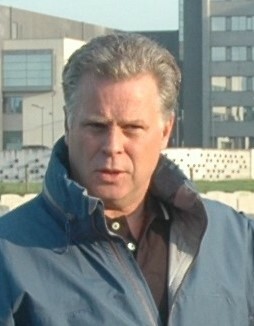 Norm has hosted many documentary series including King & Empire; King & Country, Lost Battlefields, Striking Back, Secret Liberators, In Korea and Battlefield Mysteries and has written 21 books on the Canadians in the First and Second World Ward, including the 10 volume For King and Empire Series on which the TV series was based. A metallurgical engineer by trade, Norm Christie was Chief Records Officer of the CWGC in the UK and their Administration Officer in Arras, France for 5 years. He has been taking tours to the old battlefields for more than 20 years and is recognized as Canada’s No. 1 expert on the battlefields and cemeteries of the two World Wars. Norm will be speaking at the CMHM on the topic of Masters of War, The Development of the Canadian Expeditionary Force. Following his lecture, a book signing opportunity will be available. Admission is by donation only and seating is limited. Location: Canadian Military Heritage Museum, 347 Greenwich Street, Brantford ON. Come between 5 -7 PM and enjoy a free tour of the museum. Light refreshments will follow. Parking is available and the building is wheelchair accessible. Come to the museum on Sunday, July 31st between 10 AM and 4 PM and discover our nation’s military history from the War of 1812 to current events. Admission is FREE! You will experience the thrill of watching the 13th Battalion Drill Regiment dressed in the scarlet uniform of 1862 demonstrating precise period drill plus firing volleys from reproduction rifled Enfield muskets. The Brantford Pipe and Drums will be on hand as well as numerous WWI and WWII re-enactors and a vast selection of military vehicles. Re-enactment of the HMS Magnetic 1812 cannon firing to various artillery demonstrations will take place during the day. Food and refreshments can be purchased throughout the day. Used military books for sale, various vendors, silent auction and door prizes are all part of the day’s activities. 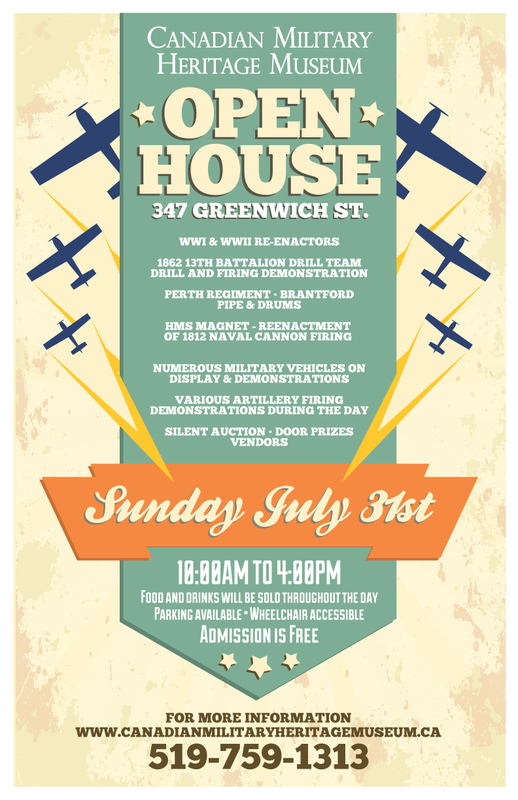 Come and enjoy the excitement of the Canadian Military Heritage Museum Annual Open House on Sunday, July 31, 2016 from 10 AM to 4 PM, 347 Greenwich Street, Brantford. The Canadian Military Heritage Museum will be participating in this year’s Brant Museum Crawl. We will be hosting an OPEN HOUSE on WEDNESDAY, MAY 25th from 10 AM to 4 PM. FREE ADDMISSION that includes a pop and hotdog. Please come, take a tour and discover our vast military history – there’s lots to see for every one! Enjoy the Crawl Week and discover the many museums and galleries that area vibrant part of Brant County. March Break is almost here and not sure what to do with the kids? Well come on down to the museum. We have extended our hours during the March Break. We will be open 10 AM – 4 PM Tuesday, March 15th to Sunday March 20th. Posted 12:23 pm by laura & filed under newsletter.